Just a quick post to prove I'm still alive and kicking. Well, alive, anyway. I think this was June 20, 1972, or thereabouts. 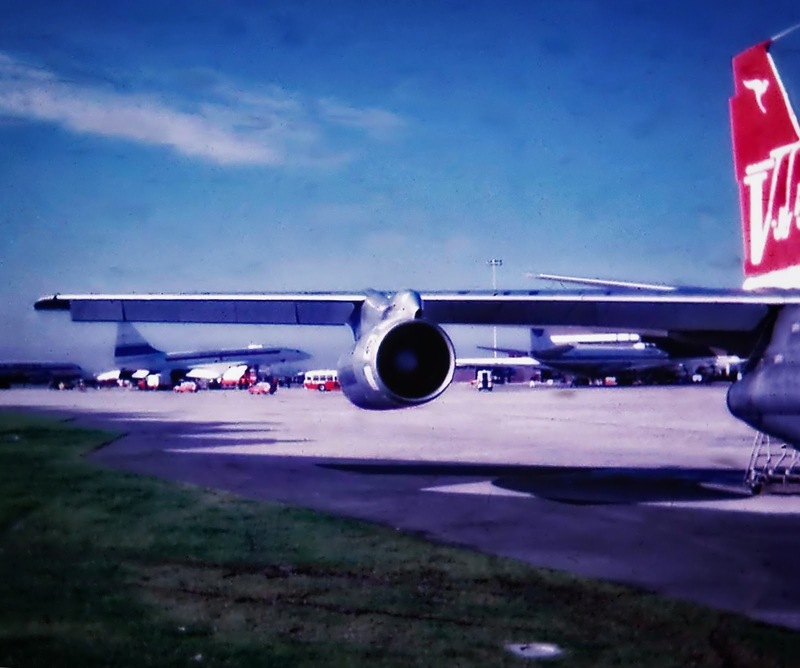 I used a Kodak Instamatic back then, and Kodachrome transparency film. It's Concorde 002, I think. First visit to Australia. 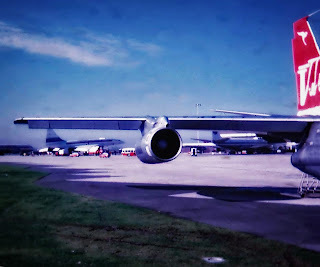 Sydney Airport International Terminal, next to a Pan Am 707 and framed by a Qantas 707 in "V-Jet" colours. Sorry about that. Well, sorry for myself, mostly. I had to take a 'health break', so the blogging had to slow to a stop. But I'm on the mend. Anyway, whilst I was off-colour, shall we say, someone pinched my domain name. Basically the renewal came around, the auto function failed and the domain went to the dark side. Apologies for that as well. "March 1933 - A Gypsy Moth aeroplane made a forced landing.. Both pilot and passenger escape injury. The pilot, Sidney Cheesewright, proprietor of the Stanmore Garage, Stanmore Road, commented that the Gypsy Moth had stalled at 1500 feet above Newington College and he chose Henson Park for an emergency landing. Mr Cheesewright, who was accompanied by John Makinen of Holmesdale Street, said that he circled around into the wind. The park looked small and I decided to make a stall landing. The airplane was severely damaged." Ah, Marrickville, how I miss thee. Australia Day 1975 PM Gough Whitlam opens "Old Sydney Town"
It's sadly very closed now, but on Australia Day 1975, PM Gough Whitlam (with wife Margaret on his right, holding a hat) opened "Old Sydney Town" at Somersby, north of Sydney. Well I was there, and I took a few pictures. This one survives. Amazing how close you could get to the Prime Minister back then, eh? (Somersby was then in contention as a site for Sydney's "2nd" airport, of course.) Whitlam later joked with some irony (whilst opening the Lachlan Vintage Village at Forbes) that "somehow people have got the idea that I like history and ruins", or words to that effect. Melbourne. It's a city somewhere south-ish of Sydney. And it bears comparison with Sydney, in an instructive sense, because it's like a sister-city, just smaller and somewhat quainter. I like it. Or it could be a bit of both. I've flown in and out of Melbourne's Tullamarine a few times, and have seen it grow from almost nothing to quite something. But it's still nothing like Sydney's Mascot. Well, it's smaller and more pleasant with a lot less history. For history try Essendon instead. There's room for growth at Tullamrine and also a case to close - or keep - Essendon, too. Even Tullamarine is getting surrounded. It's what happens - successful airports attract people and businesses. They can be closed and redeveloped but you lose the transport utility, which gets pushed further out. Currently Essendon is a mixed-use zone which retains that utility close to the CBD. Speaking of 'further out', Sydney struggled to get Badgery's up and running - if indeed it is running. Ambling, perhaps. I remember grabbing a hard-copy of the MANS report back in the 1970s, when it looked like Peat's Ridge would get the nod. And the to-ing and fro-ing that has happened ever since was fascinating to observe. Badgery's is a better site in many ways, a lot flatter and whilst slap-bang in the west of Sydney where lots of people live, still rural enough to put a buffer around the noise. It balances Mascot's extreme easterly location, certainly. Some train links would help, but buses will do for starters. And it will probably spend a few decades handling freight before pax, anyway. It's far more complicated than that, of course. Sydney also has Bankstown, just as Melbourne has Moorabbin. Both have a lot of history, although Bankstown probably wins on that score, in case you are keeping score. 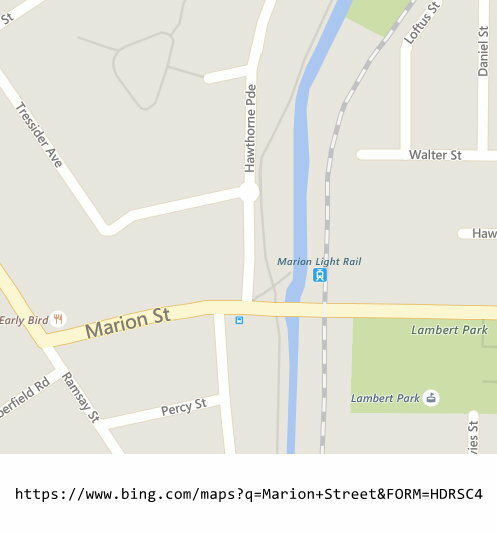 Both are hemmed in by housing and light industry plus some open space. Bankstown is almost Sydney's Essendon, but more closely parallels Moorabbin as a GA facility. The scheduled flights that have operated out of Bankstown always fell short by some measure or other and were largely abandoned, despite many efforts over the decades. WWII saw a lot of use fro Bankstown, including aircraft assembly or manufacture. Post-war has seen a gradual loss of such activity but considerable GA traffic. Being too close to Mascot and surrounded by too many vocal voters in their ever-so-local houses makes it an unlikely prospect for growth. If anything it has shrunk. So back to Melbourne. They also have Avalon, a domestic and sometime international airport with plenty of land for expansion and existing heavy-aircraft maintenance facilities situated close to Geelong. Plus a host of GA fields dotted around, like Moorabbin but also Lilydale, Bacchus Marsh and Melton. Conclusions? It's probably too early to say with any certainty, but it looks like a cross between good planning and a bit of 'I wish'. It's certainly a better situation than that of (arguably) under-resourced and ill-planned Sydney. Badgery's may change that, of course. More reading on Melbourne's "3rd" airport. And a possibly serious proposal, or some self-promotion. An historical note on aviation at Fishermen's Bend and Monomeith Park. And a mixture of historical, military and sometime civilian operations from Laverton, Point Cook and Werribee which we'll list under RAAF Williams. The more I look, the more I find. As you'd expect. I started with airstrips. First I went looking for Fleurs at Kemps Creek. And then Kennetts, at Luddenham. And then Doonside. And finally back to Badgery's. In the course of which I found this Society of model engineers (that would be engineers into models, although they may well be the very model of an engineer, who knows?). I'd heard of them but never visited. I think I should, though. The facilities (from trains to boats) look amazing. 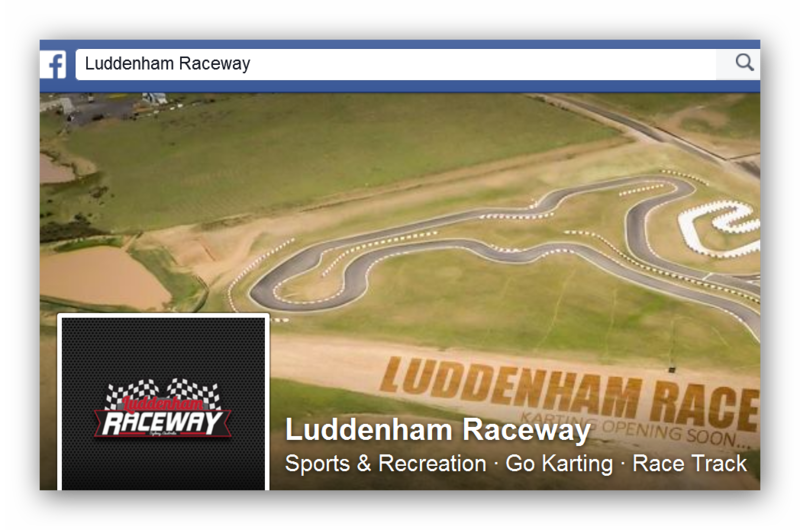 In any event it's worth checking out Luddenham. 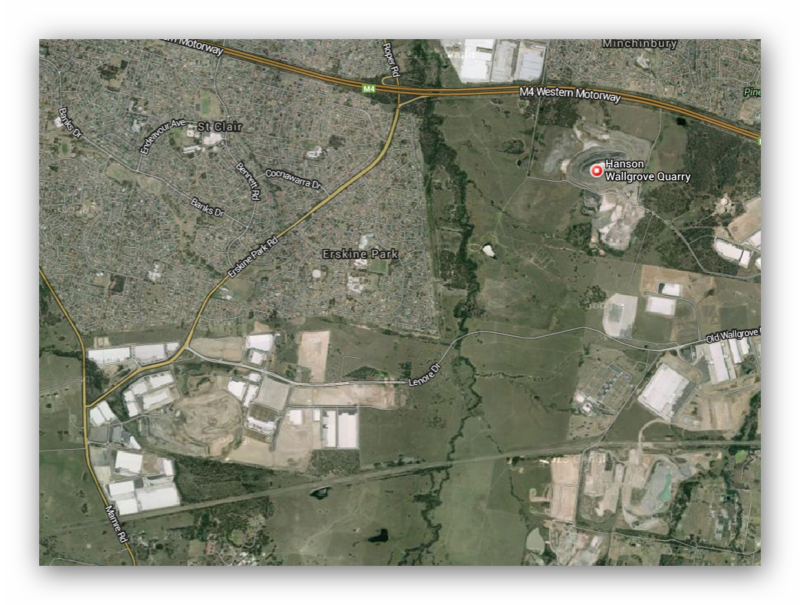 Badgery's Creek. Western Sydney Airport. Or whatever it will be called. Well it's not "new" at all, it's not the first nor the only airport (or perhaps "airstrip") in the immediate area. But if built it will be the biggest. And it is another regular public transport (RPT) airport for Sydney with full allowance for both international and domestic services as well as future capacity increases. The last EIS we have (courtesy Blacktown City Council) is huge, impressive, and out of date. Basically, all we can do is read what we have, interpret it as it stands and update it in our own heads - at least until we get told some more. This post is a stab in the dark based on what I have found. It's long, too. If it helps someone piece this together, great. 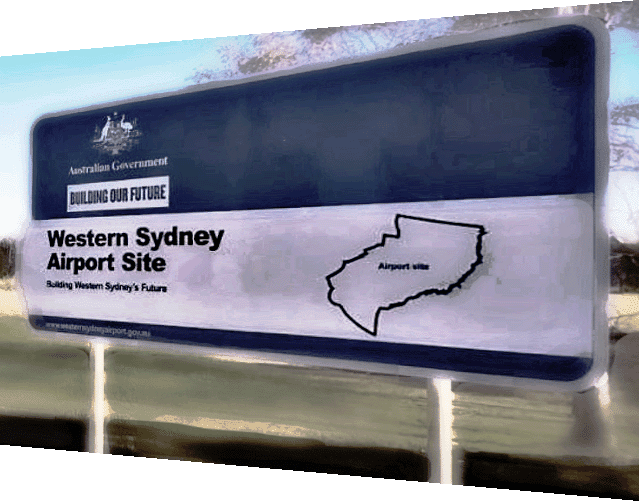 A "Western Sydney Airport"? It's not a new idea, being one of several seemingly endless options explored since the end of WWII. It is the one that has been chosen, though. Not that being chosen means much. Badgery's Creek was first "chosen" in 1986. Given the politics played out already, it conceivably may still not go ahead at all. It's not planned to be open for business until 2025, after all. 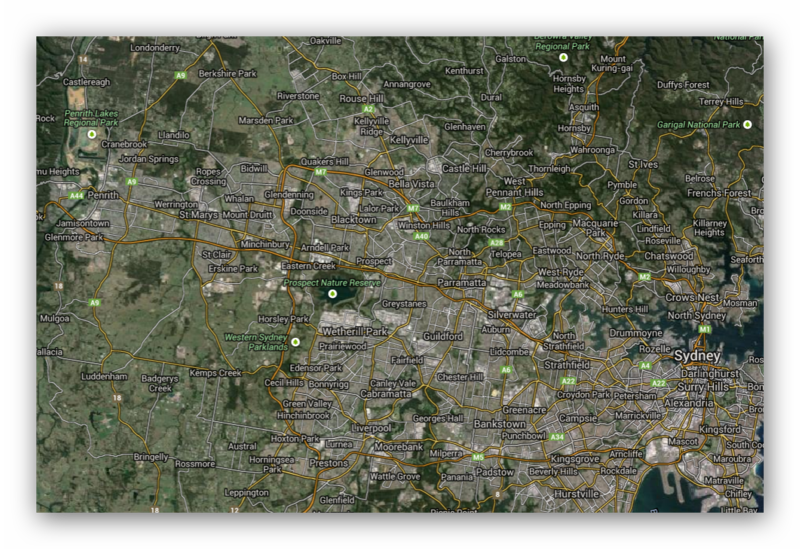 Badgery's Creek - or Western Sydney Airport (WSA) - is on the lower-centre-left of this Google Map image, Sydney (KSA) on the lower-right. Depending on how you measure it, you are looking at 40 to 50kms between them. Fancy paying for a taxi cab? Do we need it? The existing Sydney Airport can arguably handle more passengers and aircraft movements, by some accounts to 2025, by others (notably SACL, the airport owners) to 2045. Indeed aircraft movements are constrained more by legislation than by actual capacity. Whilst the legislation is there to protect residents from excessive noise, cold-hearted rationalists could observe that the cost of these restrictions to our community overall is too great. 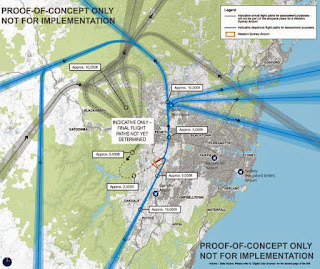 By allowing more flights in a greater spread of the day and night, or by shifting regional and/or freight traffic to existing alternatives such as Bankstown, Richmond and Camden, the "need" for a 2nd major RPT airport in Sydney is removed or at worst pushed further into the future. Could the money - some $2.4 billion for the airport infrastructure and perhaps $4 billion more for land transport - be better spent elsewhere? Investment of any sort has a varying multiplier effect on the economy and finding the investment sweet spot - the best return - matters. You don't just throw cash away and hope for the best, after all. Mind you, the stakes are high. It is a big investment that impacts the region - and the nation - socially and politically. 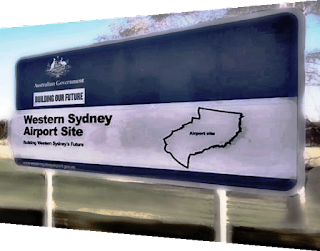 It will create local jobs - airports do that - and maybe pull some jobs away from the existing Sydney Airport. It opens up regional development more broadly, increases land value and creates opportunity. Of course such opportunities divert us from other possibilites, too. Perhaps better ones. And when land use changes the door opens to the speculators and developers. All well and good, as long as it's transparent and fair, especially to the current owners and residents. Will it get built, and will it get used? Will the airlines use it? Only if they have to, I suspect. Do existing airline operators really want an alternative Sydney operation, another terminal, more staff on the ground and the extra complication of airport transfers? If you thought it was a hassle getting from the "domestic" side of KSA to the "international", imagine what it will be like if your connecting flight is at another airport some 40 or 50 kilometres away. Hail that taxi! Existing airline operators may well hesitate; but some - perhaps those without an existing foothold at KSA - may actually want to claim Western Sydney as their own. Perhaps entirely new airlines will want "in". But which ones? Freight? Regional? Low-cost domestic inter-city? International? Will the existing Sydney airport operators, SACL accept the competition without fuss, or indeed take up their first refusal rights? As far as I know they are still in "discussion". I'm sure they'd like to lock up the whole Sydney market, if only to protect their key asset - KSA. What about the politics? Frankly, I don't think the political will is strong enough - or the election cycle long enough - to get this one off the ground as intended. With every change of government the policy shifts. In brief we have swayed from "let's do it" to "hang on, let's invest further at KSA" to "let's start small with a GA airport" and back to "no, let's do it"... peppered with the odd "how about we choose a new site?". Yes, something will get built - if real spade work actually starts in 2016. It may only be a hole in the ground, though, if even that hole gets approved. Badgery's looks and sounds too good, especially when the media spin amps up the positives for the economy of Sydney's west, to just vanish completely. It's dangling there with a lot of other investment: new roads (big orbital ones, too); new rail (well maybe, if all comes to pass); new jobs (certainly in the construction phase and probably later as well). And so on. A lot of people want a slice of this "action". But who knows exactly when or even if? What about upcoming State and Federal elections? Will the commitment remain, irrespective of result? What if the roads are built but no airport? What if the airport is scaled back in scope? What if it is built but just isn't used? What if it's just a sly way to shift some noise and aviation fuel from the east out west? Still, let's not be negative. On paper it looks attractive. If it helps build value and jobs in western Sydney, good. If it takes some noise burden away from the current KSA footprint, great. So let's assume that somehow, something good will eventuate. So what's next? OK, we have a site decision. Sure. We had that exact same decision perhaps 28-odd years ago (Hawke/Keating), except for the subsequent reversal (Howard/Costello), procrastination (everyone) and political second-guessing ever since. But now PM Abbott says "yes". Whilst a split Labor Party says "no", probably, most likely. Assuming PM Abbott doesn't pull the pin, from here we have further planning and design work to be done. Negotiations with all affected parties. Plus renewed noise and other environmental impact assessments to be done. There's an endangered environment on the site and threatened species to be protected, too. Both the known and the as-yet unknown problems will need to be resolved in order to get traction. Perhaps more land will be required as well. It all takes time. Delays abound. Keep 2025 in mind. It may slip. Probably will. Location map from the Draft 1997 EIS. What does experience tell us? As a personal learning note here, let me say that I grew up under the 16 approach at Sydney (Kingsford-Smith) Airport. It wasn't the main runway for most of my early years but it was extended and extended and even duplicated until it became the focus for most of Sydney Airport's air traffic. Interestingly whilst the noise levels and frequency of movements increased substantially over many years, they also fell at times. It wasn't a given that things just got worse. I won't say that it wasn't unsufferably noisy at times, it was, but I have to admit that 3 things in particular happened: firstly, aircraft engines became measurably quieter; secondly, those engines grew more powerful; and thirdly, on average, aircraft grew much, much larger. Another thought here is that the flight paths changed over time. Especially so for inbound traffic. 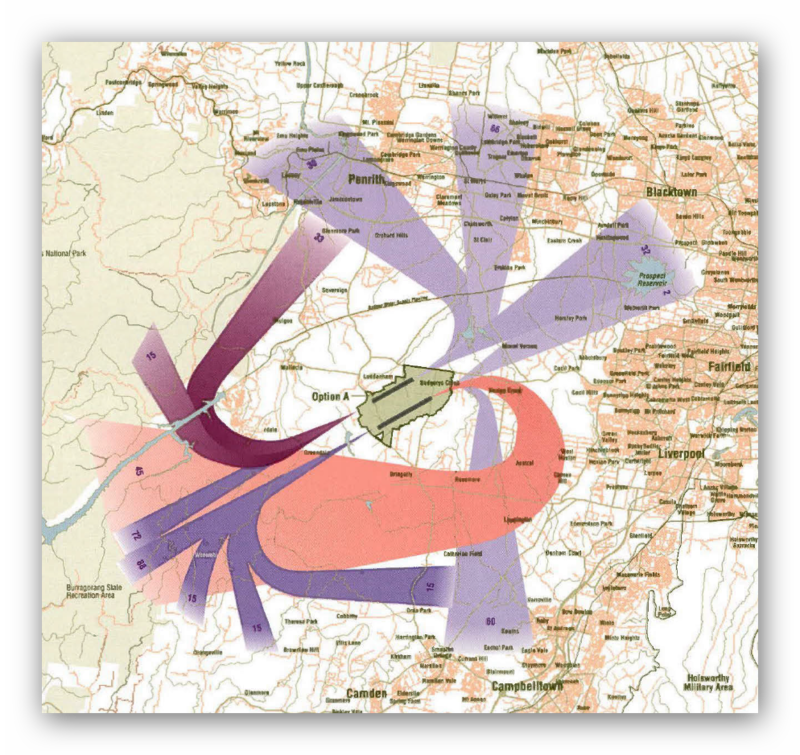 Different aircraft with different performance characteristics, coupled with evolving air trafic control procedures and technology meant changes to the areas affected by aircraft noise. Having said that, what I would suggest now is that aircraft will probably not grow much larger than they are currently. I could be wrong of course but a triple decker seems unlikely. Still, it's possible. There may even be demand for such an unwieldy beast. It's also conceivable that airliners could grow further in length; but you get into all sorts of engineering limits as such elongated designs must rotate to lift off, without tail strike. And loading weights per tyre and wheel combination are a factor, too, both in engineering the aircraft and the concrete it lands or stands upon. New configurations, even twin-fuselage designs, can't be ruled out, of course. 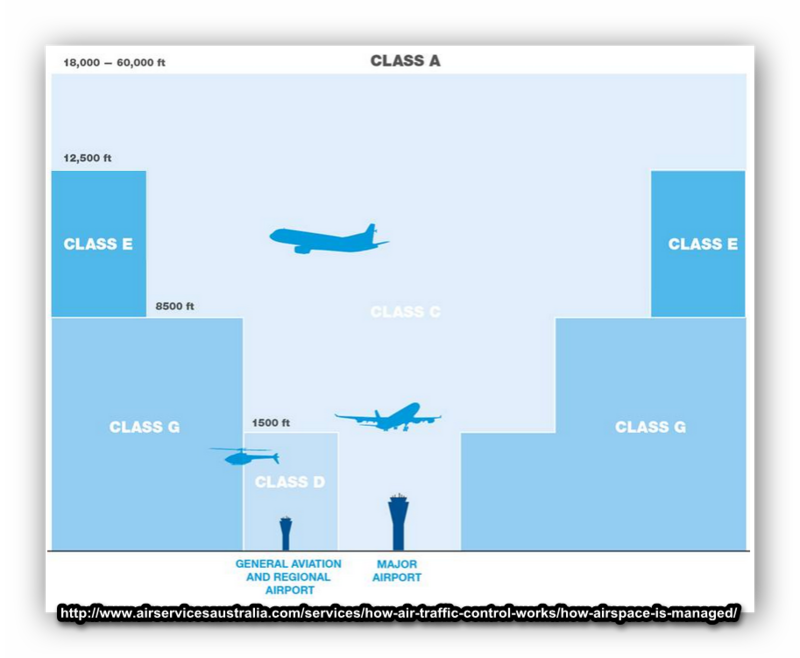 But whilst we must consider all of this in our airport design, it remains highly speculative. The problem is, should we guess wrongly with placement and design it's expensive to fix. Whatever else happens with aircraft engineering, I would expect the noise to continue to fall, if only slightly, and for aircraft engine performance to continue to improve. In this way the noise footprint will continue to shrink, particularly for departures (which require full throttle and "max noise", generally). And with better design and a bigger performance envelope comes the possibility of "sharing" the impact more widely. In theory. However the other lesson here is that successful airports attract people. If successful, it will get hemmed in by developments. But we all know this. So land will be reserved for "noise mitigation" reasons. And land will be reserved for runway duplication, too. Duplication that will inevitably widen the noise footprint. Just watch as history repeats itself. Runway alignment. A big question mark here. Given the orientation of the land already purchased, plus the prevailing winds and topography, a north-east by south-west alignment is probably what's on offer. Whilst an additional crosswind runway would aid smaller aircraft operations, particularly in the strong westerly to nor-westerly winds likely from August through to the end of summer, there's no hint as yet of extra land resumption. A shorter crosswnd runway would fit, just. 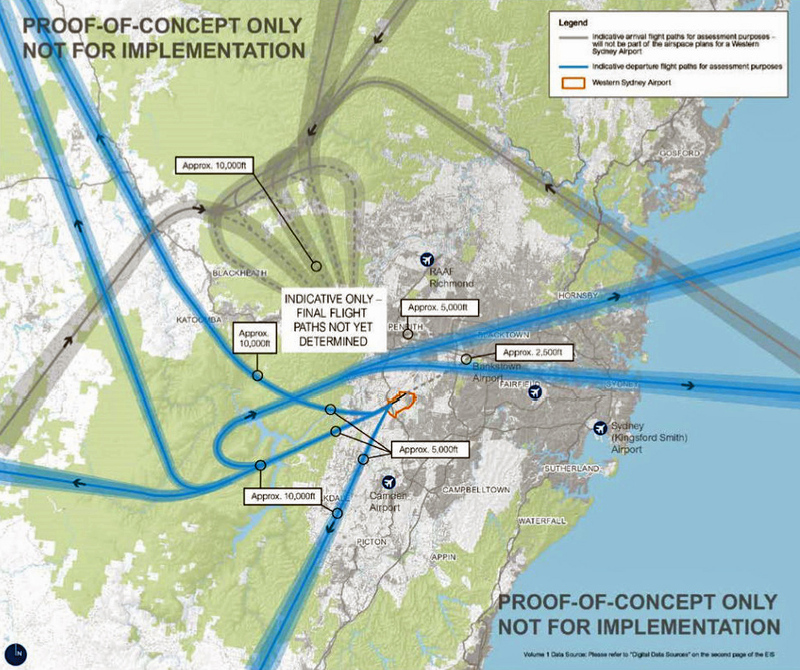 Nevertheless unless it downscales to a GA airport (to ease Bankstown's load, for example) I think a crosswind runway is unlikely, at least at the possible 2025 opening date. 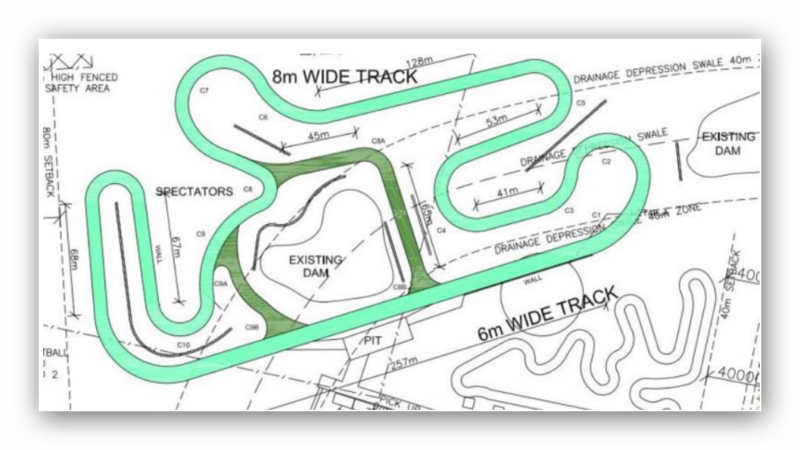 Generic master plan, from the Draft EIS again. Take it with a grain of salt, of course. Tilt it towards the north-east and it's your guess which parallel runway gets built first. Toss a coin with the shorter crosswind strip, too. If more length is added to the cross-strip (or a parallel one built) or more noise abatement required then more land will need to be acquired. Noise Footprint. 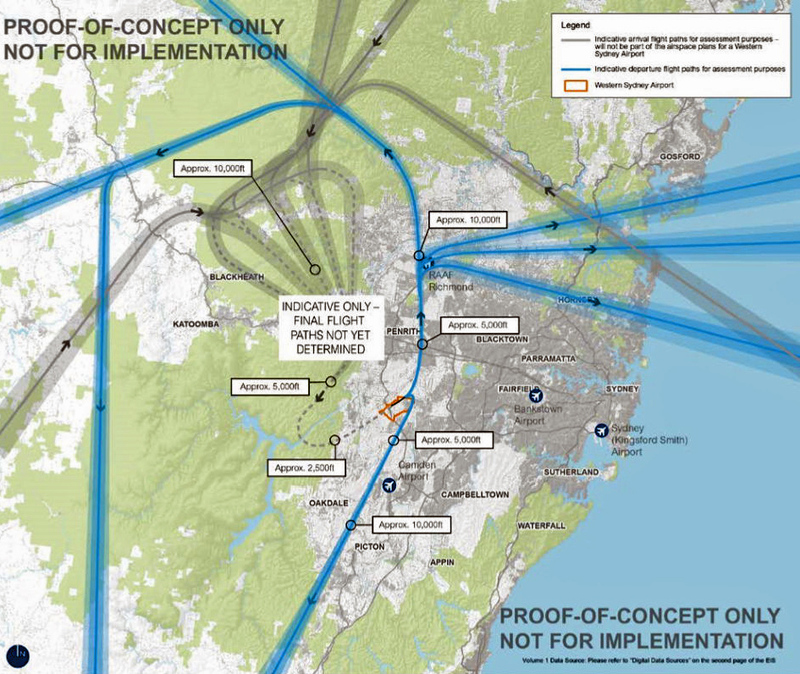 Yes, people do live in the area, but far fewer than live around Sydney's current major airport. 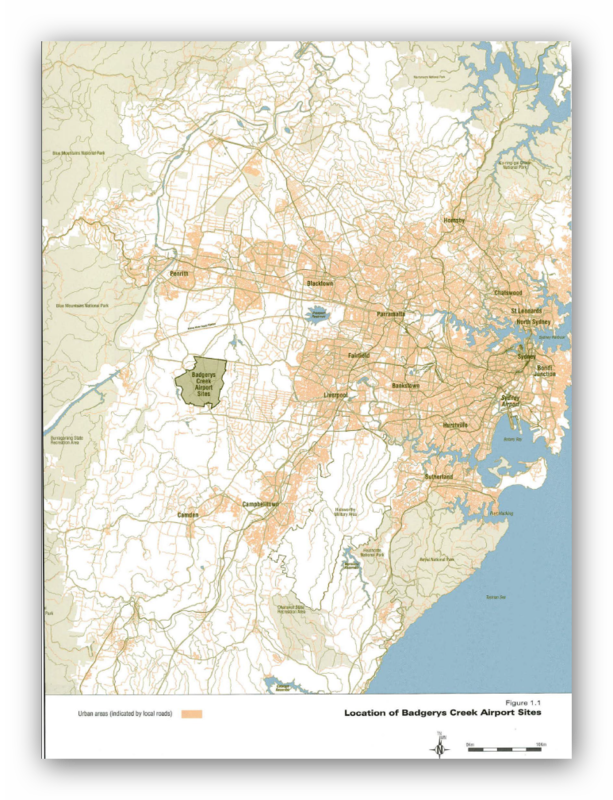 And the denser population centres are much more distant from the proposed runways than the existing high density population that surrounds all but the Botany Bay-facing runways. WSA is surrounded by paddocks, mostly. Yes, Sydney does have the benefit of Botany Bay, true. But not all traffic can come and go over the water. That's the good news: "It's not as bad as KSA". Catchy slogan, yes? Once runway alignment is agreed, which looks decidely NE-SW at this stage, integration with existing flightpaths and other airspace restrictions will have a bearing on which areas are directly under the footprint. 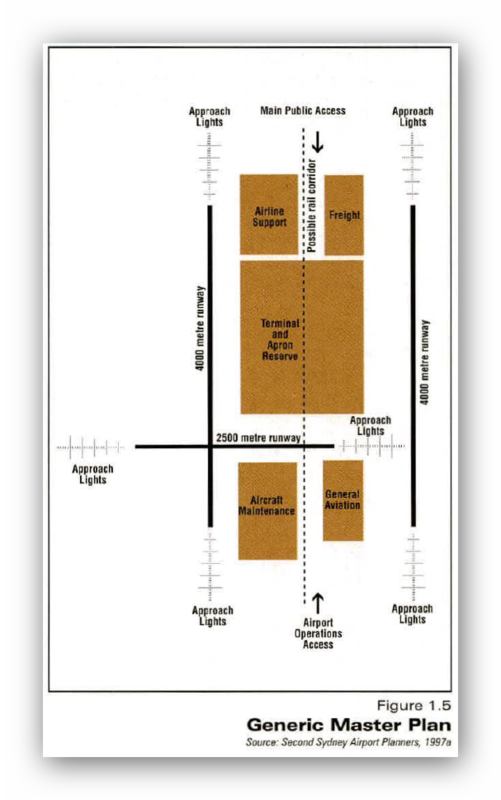 Bear in mind (a) most likely just one runway will be built in the first phase; (b) upon reaching a safe altitude aircraft will most likely turn either left or right after takeoff, depending upon destination and designated standard departure procedures; and (c) approaches will similarly include standard corridors to the left or right of the field as well as to the north and south, allowing safe traffic separation. Altitude and throttle settings are important factors in noise mitigation of course and it is likely that specific noise-limiting procedures would be implemented over residential or other sensitive areas. 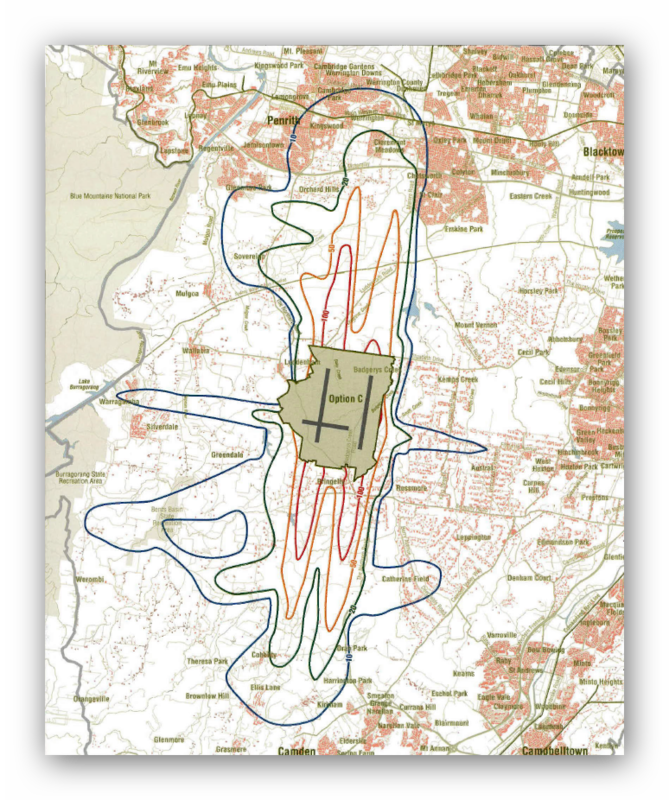 The indicative Cox Richardson graphic above shows the standard ANEF noise footprint of the assumed runway alignment overlaid on land use. 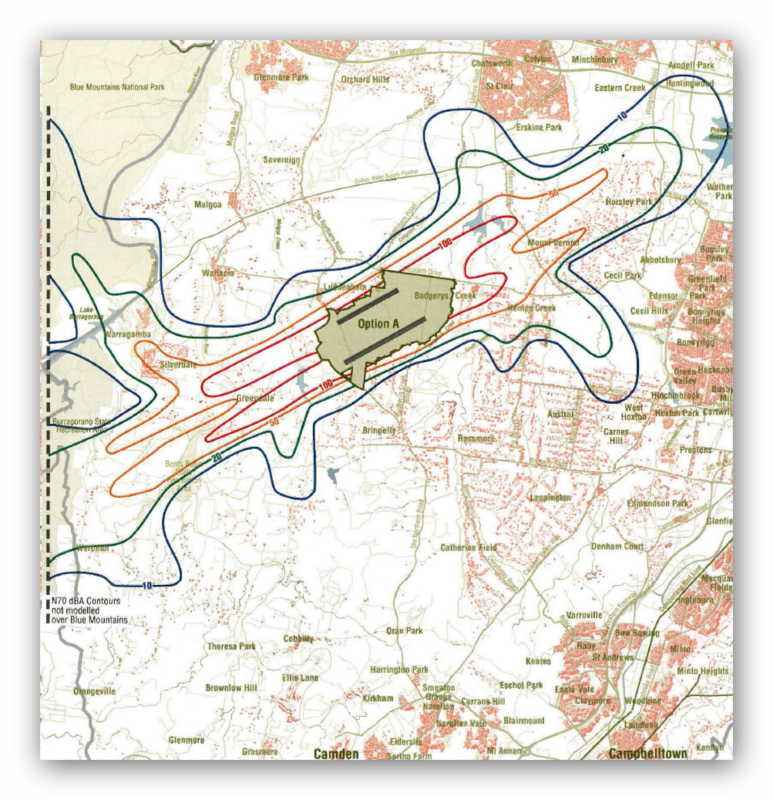 Most of the affected area has already been rezoned industrial or contains low-density residential, however the underlying assumption is for sound-proofing of affected residences as well. The areas of highest impact are relatively distant from the twin parallel runways shown, certainly so in comparison with existing impact at KSA. Nevertheless when the final alignment and flightpaths are agreed and real-world noise measurement testing is undertaken it's likely that noise-related resumptions would be considered. 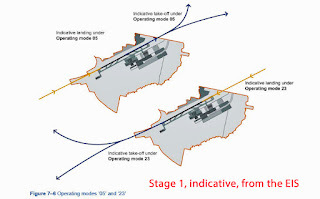 Above, that's the indicative flight path for option A, airport operation mode 1 from the '97 EIS. Don't get scared. Nothing's decided and the assumptions are both many and largely out of date. Read the full EIS or just take my word for it: it will change. Nevertheless it gives you an idea what approaches from the south west and departures to the north east may look like. But the final runway alignment? Who knows. Again, to be taken with a grain of salt: from the '97 EIS showing approaches from the north east and departures to the south west. Note that the airspace over Warragamba will be overflown only at considerable altitude, as will other water catchment areas towards the Illawarra. The '97 EIS certainly assumes that Warragamba airpsace will be used; and I do agree that it makes sense from a noise abatement perspective; however it may raise public debate over water quality and world heritage issues. It shouldn't be an issue as jet aircraft exhaust is "relatively" hot and clean, especially in comparison with internal combustion engines, and modern aircraft climb quickly. Yes, jet fuel - essentially kerosene - differs chemically from unleaded petrol, but studies have shown that aircraft exhaust "mixes" readily and disperses quickly over a wide area, whereas land-borne transportation typically disperses more slowly and creates more readily identifiable particulate deposit zones. Or to put it more clearly, you'd be far worse off beside a main road. Harking back to that Cox-Richardson landuse overlay, this image (above) is the suggested N70 noise contour for Option A, mode 1, from the '97 EIS (N70 being a different methodology from the ANEF standard). The underlying assumptions include runway heading (not locked in), 30 million passengers a year (not really likely, at least from day 1) and a fully loaded 747-300 (not going to happen so much in 2025, it'll hopefully be a mix of newer aircraft). You need to read and interpret the full EIS in context but if I dared summarise this, if you were living inside the red line you'd have a real problem; if you lived within the orange loop you'd still be upset about it; and the further out you go the less of a nuisance the noise may be. You may still be interrupted in conversation, and you may get disturbed at night. It will be an individual response. It will still matter to you, depending upon the situation. Schools and hospitals are individual cases where it may matter more. It all depends. And here (above, same source) is option C, similar assumptions (but with the crosswind runway, used sparingly). Look what happens when you rotate the runways towards north. All of what I have written already applies here - don't panic, don't assume the worst. If a runway points directly at you then yes, it's likely that you'll get some aircraft noise. But departing aircraft gain altitude, may throttle back and generally turn towards their destination; which all means that the noise diminishes from point of take off. And arriving aircraft are of course throttled back, join the approach at different points, and are at a greater altitude when at a greater distance from touch down. They do, however, make a lot of noise and vibration when using reverse thrust, but even this is mitigated by long runways and taxiways designed for faster exits. All of that aside, it's not precise, and it's full of out of date assumptions; but it does give you a rough idea, though. World Heritage areas will likely also be "out", as will the rising land to the west, except, again, at altitude, and in a designated corridor. 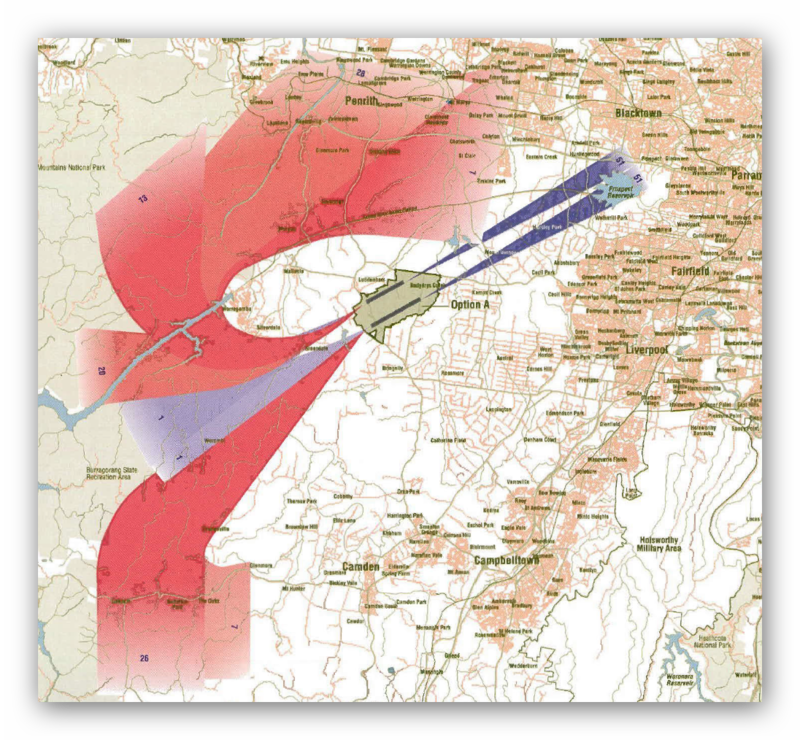 Military airspace too will be "out"; so dodging around Richmond and Holsworthy will be a given, although again the airspace restrictions are governed by altitude (ie there is an upper cap to the restricted military airspace, allowing overflights). But - like I've said - we don't know for sure about any of this - yet. Bear in mind too that whilst aviation noise is unique in character it is not alone in affecting quality of life. Road and rail noise impact is real as well. And I haven't even touched on that. And I haven't mentioned air pollution either (it'll probably improve to the east of the field and worsen to the west); or even "odour". Yes, people complain about KSA's smell, although how they can tell it's an airport smell from 10km or more away is beyond me. Personally I can recognise that 'aviation kerosene' smell only up to about 5km away... anyway, it's all in the '97 EIS. It gets complicated. It's not just noise mitigation that needs to be catered for. Of course you need to separate air traffic safely, too; so the airspace around Sydney, Bankstown and Camden airports will need to be accommodated; as will Albion Park, Wedderburn, Wilton, Warnervale and The Oaks airfields, too. Mixed air traffic would approach and depart these airports via defined corridors, in some cases by special exemption from otherwise strictly controlled airspace, or by curtailed control zones for individual airports. This is done now to separate Bankstown's general aviation traffic from Sydney's control whilst allowing such mixed traffic to flow freely. Of course "layers" of traffic will be separated by altitude, too, as they are now. It can be done, it's not rocket science - especially when you realise that the aviation world operates in an environment based on airspace stacks, separated not just horizontally but vertically as well. And in the end all things are possible if enough money is thrown at the problem. If the preferred solution is closure of one or more airports (or conflicting runways) then - presumably - compensation would be required. Transport integration. A big one. Improved roads and (perhaps) heavy rail are planned but it's roads first (for now). Whilst roads are important, it's worth noting that over-encouragement of private motor vehicle use increases demand for car parking, including "drop off" zones, and may lead to road congestion and capacity "pinch points". Sydney Airport's Domestic terminals are, for example, constrained by the capacity of the loop road that feeds the terminals. Whilst suitable shuttle buses on appropriate routes will ease those problems, light or heavy rail options appear preferable to many. Shuttle buses, after all, are also "traffic". If the Very Fast Train (VFT - or High Speed Rail) is a goer (and not a white elephant in disguise) then will it run via Sydney Airport or via Badgery's Creek? Neither? Or both? What about compensation for the "losers" in each scenario? Indeed the VFT represents competition for commercial aviation and may seek to navigate between the airports, even if the public good appears to favour connectivity rather than separation. There are huge arguments yet to come. At least there's the semblance of a NSW Government plan with heavy rail extensions and reservations to service Badgery's. All drawn on a nice chart. 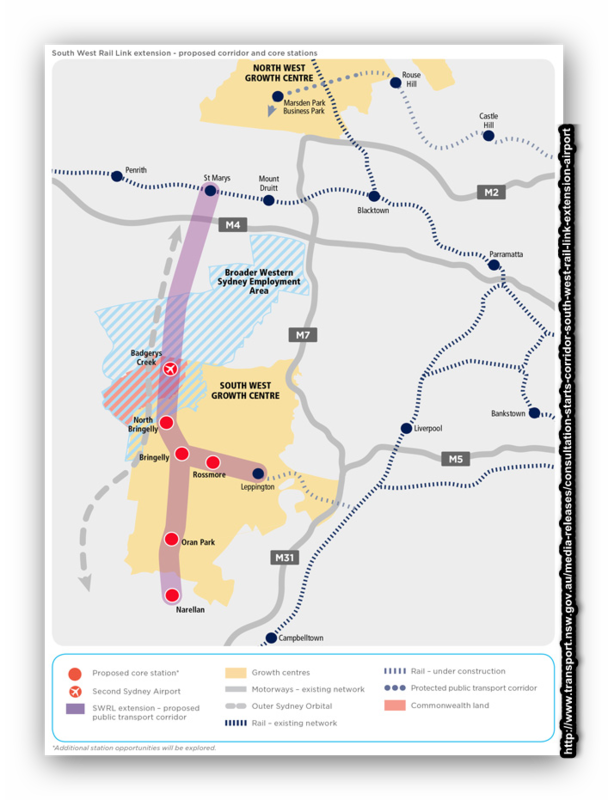 But with a "roads first" policy in action currently the likelihood is for multiple shuttle bus routes from Badgery's Creek to nearby heavy rail stations, to Parramatta CBD and on to Sydney Airport itself. For now, anyway. Or catch a taxi, of course. Further land acquisition? 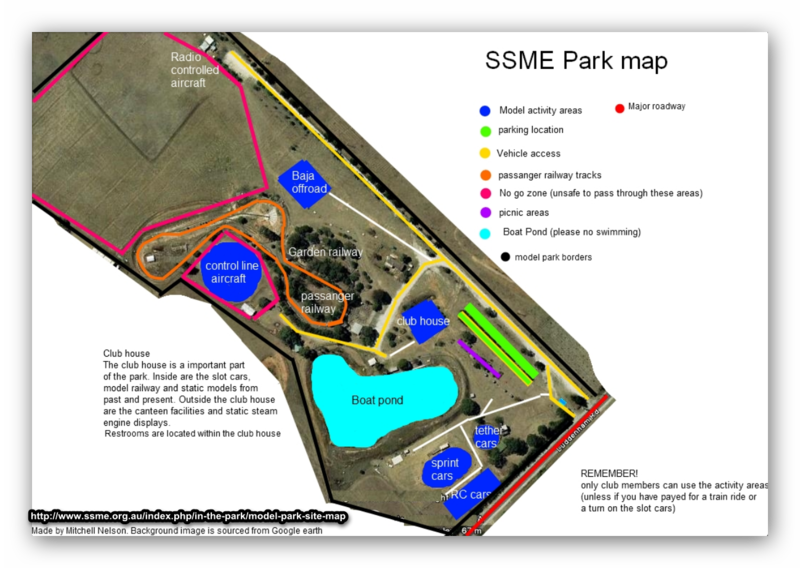 The Ernst and Young Economic and Social Impact report (2012) suggested that "the latest footprint of the site will still require additional property (30 lots) to be compulsorily acquired at the southern end of the site. In line with Australian health and safety standards for noise pollution, properties located within Australian Noise Exposure Concept (ANEC) contours 40, 35 and 30 should be acquired by the Commonwealth Government. The analysis undertaken by WorleyParsons found that there could be up to a further 62 allotments that should be considered for compulsory acquisition as a result of noise impacts from the airport". I doubt that a crosswind runway would eventuate, however if it did it would be constrained within the current site to well under 3000m. If proceeded with, further land acquisitions to the east and/or west may have to be considered. It would be for regional or smaller aircraft, generally, or larger aircraft landings. Other risk factors. Much (if not all) of the reasoning behind a Western Sydney Airport is predicated on continuing - and expanding - demand for air travel. Underpinning that demand is the rate of world and local economic growth, which is currently subdued by many factors. One big factor is predicted global climate change. If current climate trends continue (as seems likely) then an increasing amount of world economic activity will focus on renewable energy provision and alternative, low-energy transport systems. How aviation - as a high-energy activity, especially on take-off - fits into that scenario is moot. It is likely that commercial aviation will face stiffer competition from alternatives such as high speed rail (HSR) over time. Whilst there are currently no HSR projects underway in Australia there is a groundswell of opinion in favour of it. Such projects would have obvious impact on both major regular public transport (RPT) airports, Sydney and Western Sydney. It is also worth noting that Sydney Airport faces the allied and perhaps more pressing impact of rising sea levels, which ultimately could strongly favour Western Sydney Airport's cost competitiveness. If world action on climate change continues to grow then the possibility exists for commercial aviation to be identified more negatively and government action taken to dampen demand. This could be by direct-cost imposition of levies or taxes. The least impactful (whilst still effective) method would be via an emissions trading scheme (ETS). Many countries are indeed taking the latter approach. Ironically, of course, Australia has reversed its tactics in this regard, repealing the carbon tax, the precursor to an intended ETS. So what is likely to change? Everything. The expense is huge and variable, both in dollar terms and the human and environmental cost. The pay-off is big but less certain; but to not act - after decades of indecision - risks hitting some sort of capacity limit with current aviation infrastructure. It's a gamble either way. More to come, I'm sure! Oh, and someone seems to have their own airport design already in place on the Badgery's site (via Google). At the end of the day you may weigh it all up - the noise, the traffic, the polution - and think it's a good idea overall. It saves driving to KSA when you need to get to the airport. And you may even get a better paid job out of it. Or maybe you'd just prefer a High Speed Train instead. It's your vote, and I suspect the whole issue will crop up at elections, State and Federal, more than a few times before we reach 2025. An interesting timeline on Sydney's airport planning. James Badgery - was into the ponies. And for your amusement and edification, how about this impressively obsessive Condell Park site seemingly dedicated to defending the Bankstown community against any expansion of their local General Aviation airport. The detail is amazing (although sometimes colourful, incomplete, out of date and always biased) and they have done a lot of research, especially on runway length. Bankstown, of course, was once paddocks and no-one really complained about its wartime use by a variety of forces (who would dare, of course). But post-war many people (including an aunt and uncle of mine) moved in and hemmed the airport in from several sides - but especially from the eastern, runway-facing Condell Park side - and to the north. It's no one person's fault but it's a classic tale of airports attracting jobs, people and their houses. Or check out my ever-growing list of Sydney's past and present airfields and airports. Ah, the Mulgoa Irrigation Scheme. I'm not kidding. The Orchard Hills area and the York Estate (to the north of Mulgoa) were within scope of this ultimately unsuccessful irrigation scheme. The promoter was George Chaffey, the Canadian irrigator who had arguably failed, despite considerable effort, expense and no little amount of political struggle to make a success of the irrigation scheme at Mildura, in company with Sydney local Henry Gorman (of Hardie and Gorman, estate agent and property speculators) and Arthur Winbourn Stephen of Mulgoa. Chaffey was joined by his brothers in his efforts to make the Mildura scheme work and, to be fair, as a family they finally managed to demonstrate some progress. Ultimately, though, it was left to Mildura locals and the state government to grow the scheme into its later, broader success. The Mulgoa Valley scheme however was buoyed more by the Chaffey's North American successes and was duly authorised by the Mulgoa Irrigation Act, as passed in December 1890. The Act permitted the promoters to acquire land, erect plant, and use and distribute the waters of the Warragamba River through to South Creek and as far north as St. Marys. The proposal was contemporary with the Wentworth irrigation scheme. It wasn't the first time that irrigation was used in Mulgoa but it was the most ambitious attempt. A more successful - if short-lived - example was in evidence just a year earlier at George Cox’s Winbourn(e) estate. The irrigation engineering included a 16 h.p. steam-driven pump and a 75,000 gallon capacity cement-lined reservoir set atop the hill above the house. There is a photograph of the pump site and remains (as they were) here. More photographs may be found in the Penrith City heritage database. Some Cox family history, perhaps? William Cox was born at Wimbourne Minster, Dorset, England in 1764, eventually becoming a Lieutenant in the New South Wales Corps. He arrived in Sydney on 11th January 1800, accompanied by his wife and four sons: James (aged 10); Charles (7); George (5); and Henry (4). After an unsuccessful start at “Brush Farm” (Pennant Hills), William and his family settled in 1804 at Windsor, on his Clarendon property. 1815 William was - famously - in charge of constructing a road over the Blue Mountains. The Coxes became interested in land in the Mulgoa district, and Edward - at the age of 4 years - received the first grant of 300 acres in 1810. Edward's property is known as “Fernhill”. George’s grant of 600 acres was made in 1816, being the future “Winbourne”. George, his father and brothers also took up land in the Mudgee district. George's obituary in the Sydney Morning Herald may be found at Trove. In contrast to Winbourn(e), the more ambitious Mulgoa Irrigation Scheme required the sinking of a 47 ft deep brick-lined shaft complete with connecting tunnel. Water would be drawn from the Nepean River and then stored in a 4 million gallon earthen dam. At the wellhead a steam driven suction pump was apparently erected. From the reservoir at Mulgoa Rd a canal (only partially completed) went due south before turning east and then north-east including tunnels under Littlefields Road and The Northern Road (then Bringelly Rd), wending its way north to the St. Marys district. Integral to the scheme were the town and farm subdivisions of Littlefields, formerly part of Cox's earlier attempt at Winbourn(e). Two new towns were also planned, being Sovereign Town and the Mulgoa Irrigation settlement. The company was listed on the stock exchange in April 1892. Having completed the engine house the company went into liquidation in May 1893, with the works being sold at auction in 1898. All screenshots via Google Maps. Mulgoa is Darug people's country. More detail is available at this Penrith City website. By the way, I'm not obsessed with the history of military establishments in Sydney, it just happens that many of the locations that interest me have military links. And one thing just leads to another, doesn't it? Anyway, to get back to the subject in hand, No. 1 Central Ammunition Depot (1 CAMD) was originally formed as 1 Central Reserve at Marrangaroo, New South Wales on 1 April 1942. Sub-depots were also formed at Moorebank and Glenbrook. The primary role was storage and supply of munitions for the RAAF. In August 1942 Picton (Redbank Range) railway tunnel became a storage area and given the title 4 Sub-Depot. Further sub-depots created included Glenbrook (Lapstone) tunnel, Clarence Tunnel, Kowguren (Qld), Hume Camp (Albury), Mt. 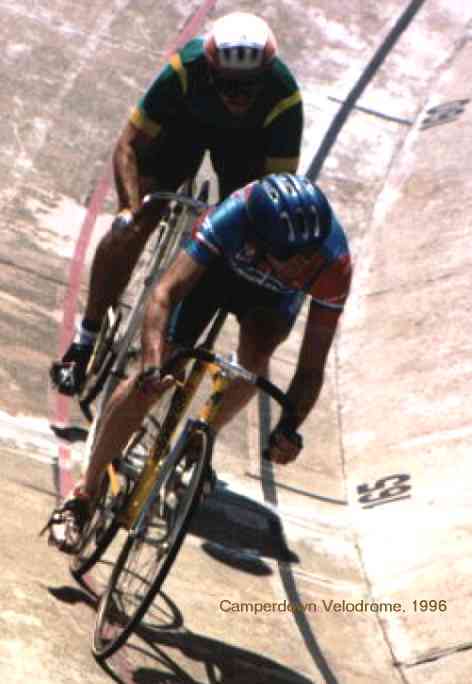 Druitt and Kingswood (probably St Marys). And of course Ropes Crossing was a nearby munitions factory with its own railway branchline and extensive internal tramway. But let's describe what was once Marrangaroo Army Camp in a bit more detail. It's near Lithgow, NSW, situated at the end of Reserve Road. It was a major ammunition depot from 1941 to the late 1980s. 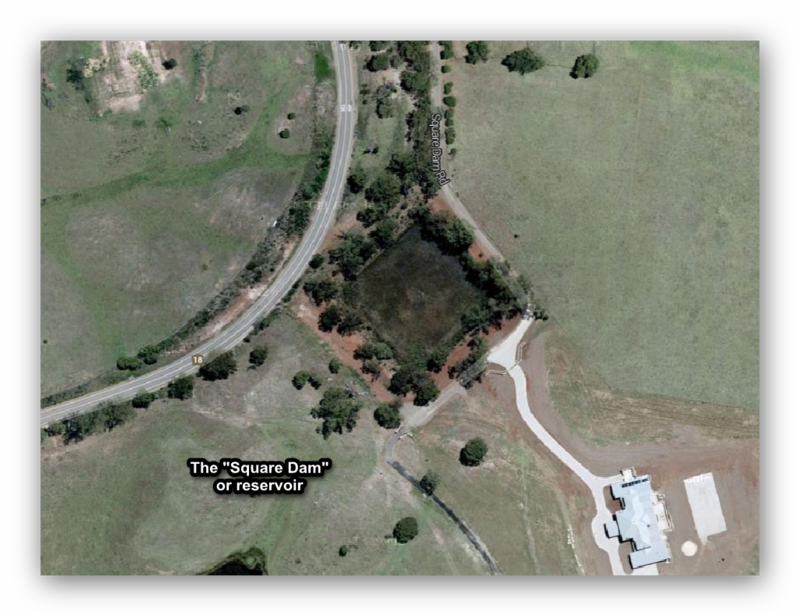 It is now used for demolitions and training by all three Australian Defence Force services. But it's not Orchard Hills, is it? If you look closely and zoom in on the Google Map you'll see traces of the old spur line branching from the main railway line, entering the defence lands on the northern side of the existing buildings. 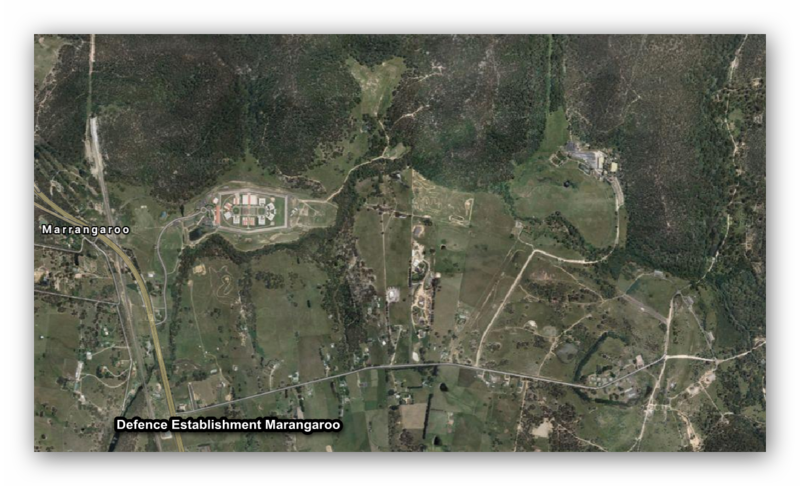 It's worth noting that during World War II Marrangaroo housed then-secret wartime chemical warfare facilities; Marrangaroo was the administration headquarters for all of the Royal Australian Air Force chemical weapons Stores, kept in tunnels and sidings at Marrangaroo and the various (otherwise disused) railway tunnels previously mentioned. In September 1943 a War Dog Training School was established at Marrangaroo, transferring to the dispersal airstrip at Mt.Druitt in 1944. Which (finally) brings us to Orchard Hills. The 1 Central Reserve headquarters were transferred to Kingswood (Orchard Hills) on 12 November 1956. Marrangaroo closed in 1958 (to reopen as a joint services training facility at a later date). The RAAF first began using the Kingswood site in early 1945 for local explosive storage. This avoided double-handling of explosives on consignment to and from Sydney. The Royal Navy and Royal Australian Navy also used the area to store wartime munitions (see below). After the transfer in 1956, Kingswood was developed further to encompass guided weapons as well as the disposal of obsolete munitions. 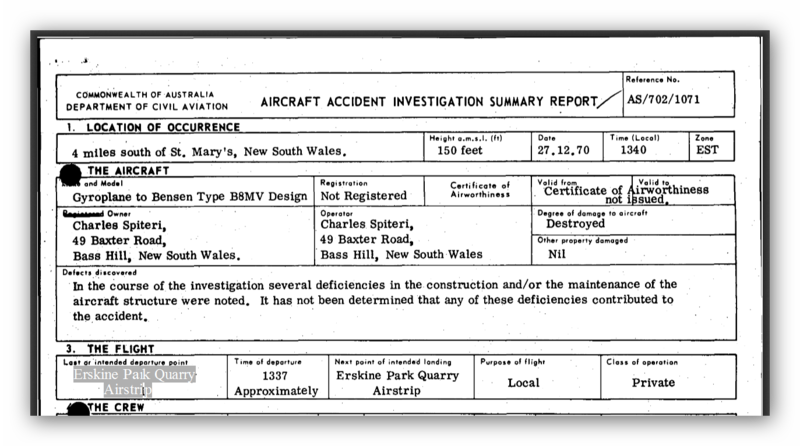 From January 1963, 1 Central Reserve's responsibility included explosive inspection of all RAAF units. On 1 October 1967, 1 Central Reserve was renamed 1 Central Ammunition Depot, its role evolving over time into a centre of expertise for the handling and storage of explosive ordnance as well as training. 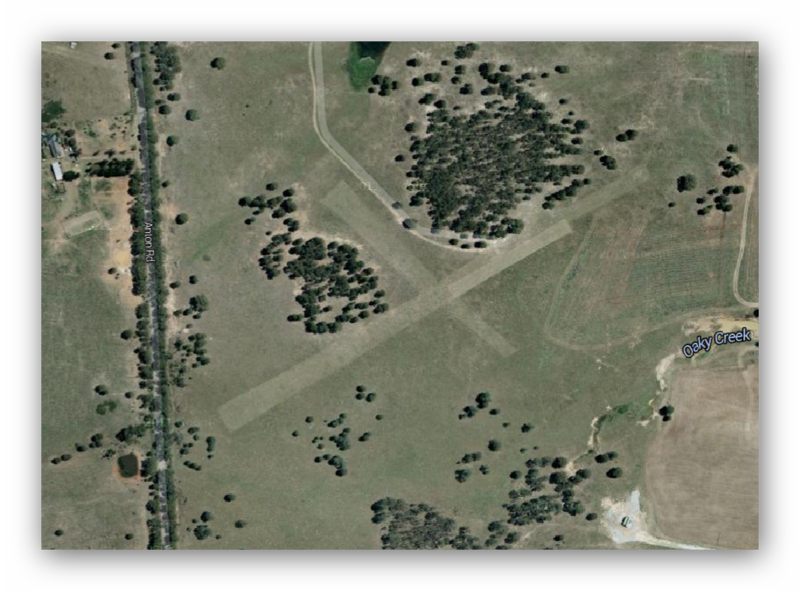 In April 1993 the Bogan Gate depot (2 Base Ammunition Depot Bogan Gate approx 40kms west of Parkes) was reactivated as Detachment A to 1 CAMD, with excess ordnance from Kingswood being relocated from July 1993 for long term storage. A more extensive history (from which much of the above was derived) is available at Robert Curran's RAN Armament website. 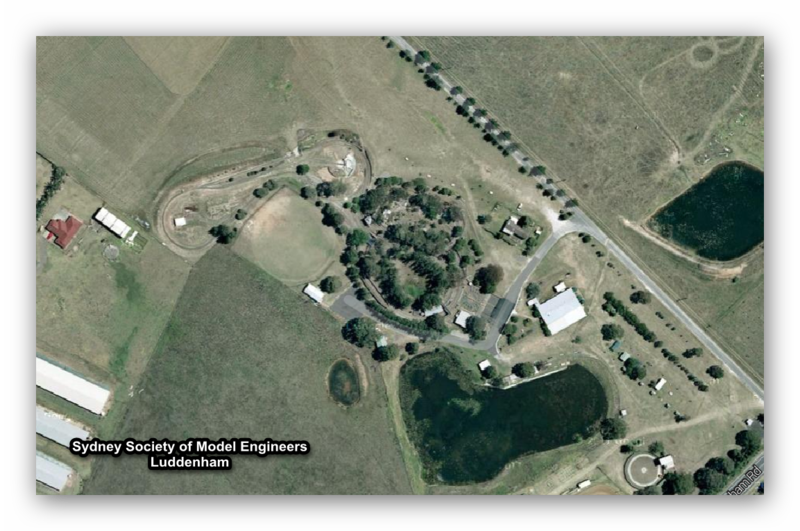 Further detailed work including original land grants may be found at this Penrith City website. That resource includes details on Frogmore, Regentville and the Mulgoa Irrigation Scheme. I'm not kidding. The Orchard Hills area and the York Estate (to the north) were within scope of this proposed and ultimately unsuccessful irrigation scheme. The promoter was George Chaffey, the Canadian irrigator who had arguably failed, despite considerable effort, expense and no little amount of political struggle to make a success of the irrigation scheme at Mildura, in company with Henry Gorman (of Hardie and Gorman, estate agent and property speculators) and Arthur Winbourn Stephen of Mulgoa. The scheme was authorised by the Mulgoa Irrigation Act, as passed in December 1890, which permitted the promoters to acquire land, erect plant, and use and distribute the waters of the Warragamba River through to South Creek and as far north as St. Marys. The proposal was contemporary with the Wentworth irrigation scheme. It wasn't the first time that irrigation was used in Mulgoa but it was the most ambitious attempt. A more successful - if short-lived - example was in evidence just a year earlier at George Cox’s Winbourn estate. The irrigation engineering included a 16 h.p. steam-driven pump and a 75,000 gallon capacity cement-lined reservoir set atop the hill above the house. In contrast the more ambitious Mulgoa Irrigation Scheme required the sinking of a 47 ft deep brick-lined shaft complete with connecting tunnel. Water would be drawn from the Nepean River and then stored in a 4 million gallon earthen dam. At the wellhead a steam driven suction pump was apparently erected. From the reservoir a canal (only partially completed) including tunnels under Littlefields Road and The Northern Road, wended its way north-east to the St. Marys district. Integral to the scheme were the town and farm subdivisions of Littlefields, formerly part of Cox's earlier attempt at Winbourne. 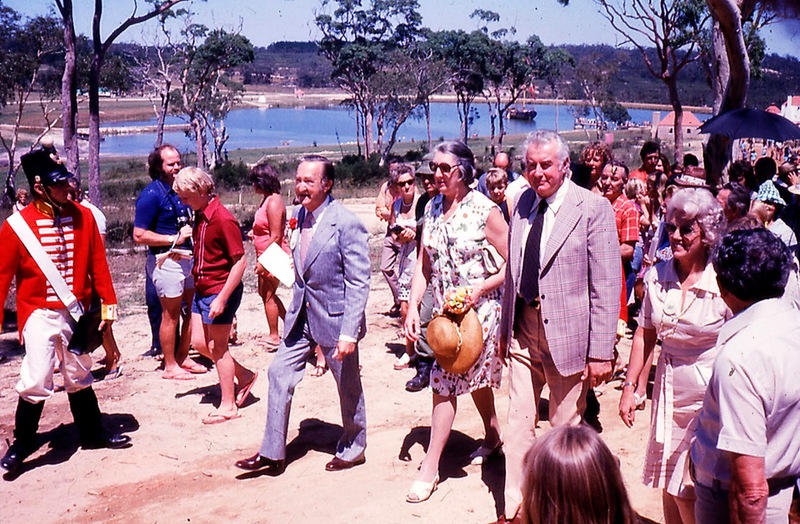 Two new towns were also planned, being Sovereign Town and the Mulgoa Irrigation settlement. The company was listed on the stock exchange in April 1892. Having completed the engine house the company went into liquidation in May 1893, with the works being sold at auction in 1898. More detail is available at this Penrith City website. But I digress. Other sources have suggested that naval armoury needs also drove development of Orchard Hills. In 1944 the Royal Navy (RN) took over operations of the Schofields airfield (well to the north of Orchard Hills) in preparation for the planned assault on Japan; Schofields thus became the support base for the RN Fleet Air Arm; by April 1945 some 1,600 personnel were stationed at the Schofields base. Presumably they needed to house some ammunition, too, preferably well away from civilians (and themselves). So the establishment of an ordnance storage facility at Orchard Hills, circa 1945, for both the RN and the Royal Australian Navy (RAN) was a justifiable outcome. Later the RN/RAN facility became No. 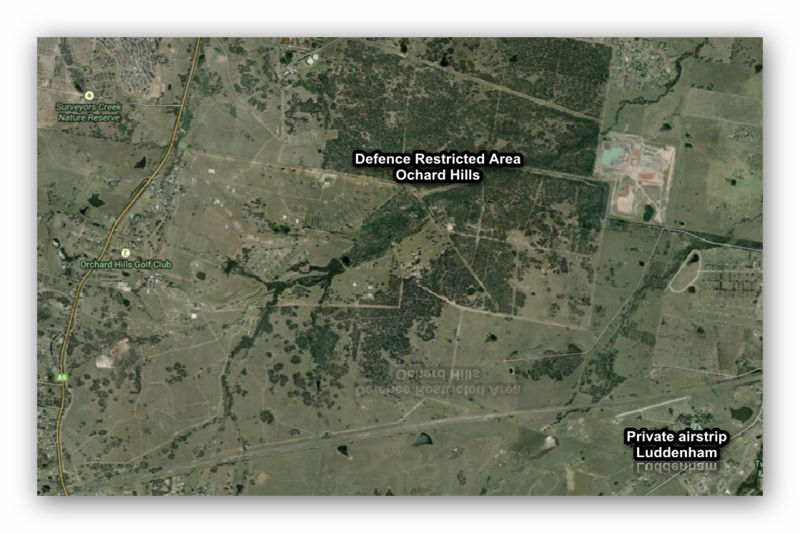 1 Central Ammunition Depot for the RAAF and RAN, and more recently "Defence Establishment Orchard Hills". I believe it's on the market if you are looking for a sizable block of land in the area. Image via Google Maps, by the way. The Orchard Hills establishment fills the centre of the screenshot. In the southwest corner of the defence land is the "old" or "ANZAC" area, occupied by the US Army for munitions purposes from 1942 until war's end. The old road layout can still be seen. Again Robert Curran's website provides more detail. Penrith is to the north and slightly west, out of view in this image. Richmond is further north again and Schofields a little closer and slightly east. You can see Sydney's water supply running left to right in pipes at the bottom of the image. 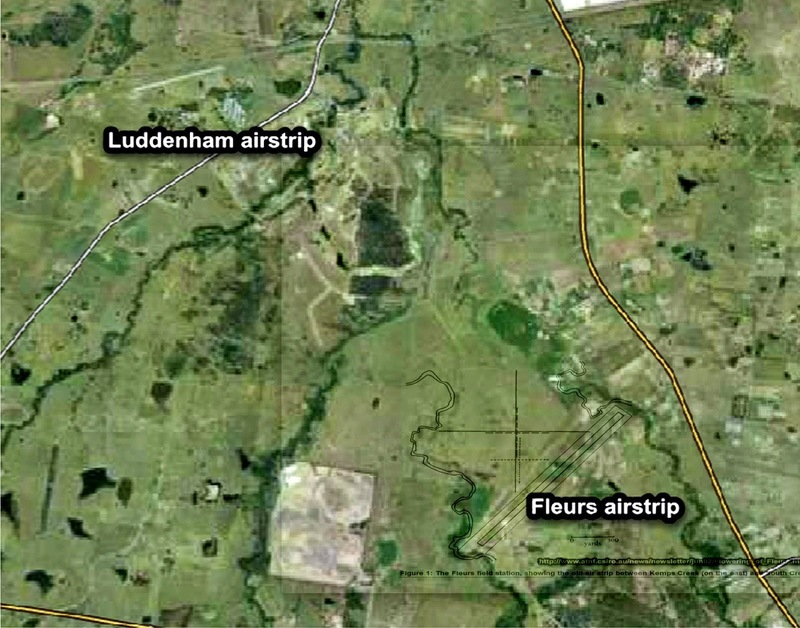 The airstrip on private land south of those pipes is Kennett's airfield ("Kennett G C & H L Pastoral & Aviation" in the Yellowpages) at Luddenham (near the old RAAF Fleurs strip). You can see a couple of hangars and a parked C337 by the looks of it if you zoom in close enough.